Kranimex Ltd., as an exclusive representative of the Liebherr company for the Czech and Slovak Republic, provides sale and service of Liebherr tower cranes. The offer of the German crane manufacturer represents an integrated production program. Its wide supply of systems, application of up-to-date technology, high quality and reliability will meet requirements even of the most exacting customer. 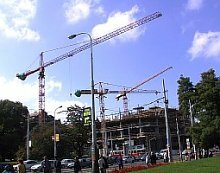 Kranimex also offers leasing of the Liebherr tower cranes out of hire office, including their assembly, dismantling and crane-work supplies.